I was super blessed to get to talk to Susie over at Mommy Pads and More about doing a giveaway for you guys. Susie also sent me an amazing return address stamp to review. 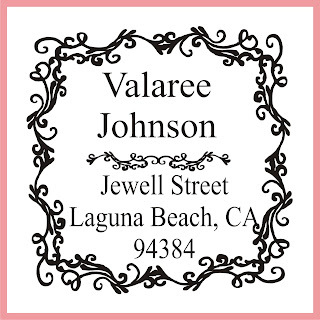 For privacy reasons I will not share the one I specifically received with our name and address but I will tell you that it is the Valeree stamp and I chose purple ink, naturally (my fave color)! The process- It was so easy to order the stamp! I simply gave all the important information and Susie sent me a proof. When I verified my information was correct she got my stamp made and shipped; all in about a week. That is a great turnaround for a personalized item. The hard part? Choosing which stamp I wanted! I can't find one thing to complain about in regards to the customer service, shipment, time or even the stamp itself. It was just a pleasant, quick experience. 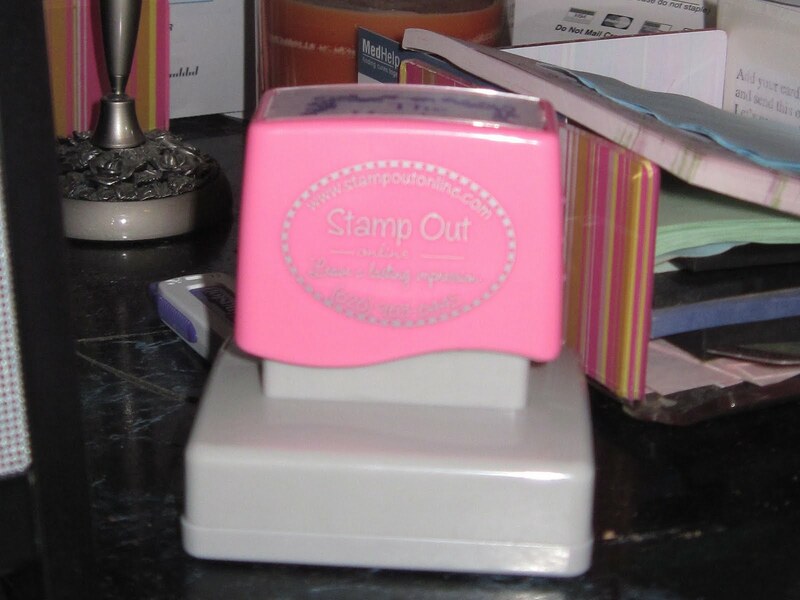 The stamp- My opinion of the stamp that I received is that it is absolutely perfect, amazing and functional! I was so excited to receive the stamp and didn't really know what to use it for other than sending out mail. I ended up doing invitations for a bridal shower recently and this stamp ended up being the best thing I could've come across to stamp onto the envelopes! Everyone noticed the stamp and commented on how beautiful the design was. NOTE- do not press hard! And you do want to stamp on a very flat surface. The first couple of times I made the mistake of pressing and pressing really hard and it smudged the ink really bad. So from then on I just pushed down once with minimal pressure and my stamping came out perfectly. Mommy Pads and More has more than just return address stamps! They carry stationary, other stamps and jewelry- all customizable. One reader will win their choice of a personalized notepad or stamp valued up to $32! And YES! This is open worldwide!!! Visit Mommy Pads and More, browse around, and then come back here to leave me a comment about which stamp or notepad you would choose if you won! All opinions expressed herein are entirely my own; I was not compensated for them. I did receive a product to review which did not bias my opinion. Thank you Susie for this opportunity! I would choose the Wilson return address stamp. So classy! I grabbed your Girly Girl Giveaways button. It's on the right hand side below my Etsy Mini. i would choose the wilson stamp, its gorgeous!! I would choose the Thompson stamp. Wow a great place to get stamps! I would for sure get the "Paula Business Stamp" to stamp my packages! I follow Mommy Pads and More on Twitter! The made with love stamp is my favorite. Cute! I would choose the goss library stamp as it is so cute! I'm following through Google Friend Connect as "libbeh"
Greetings from Malaysia! I'm already a follower of your blog via Google Friend Connect. Greetings from Malaysia! I have your blog button in my "Reviews & Giveaways I ♥ !" sidebar. I love the Randle return address stamp. I like the peterson stamp. the kape stamp is pretty neat. I would pick the eddins pad with matching ribbon. I would get either the Carrie stamp or the kape stamp. Thanks! I would choose the Johnson stamp! I would pick the Return Address Stamp - Collett !!!! I follow MommyPads on Twitter ! 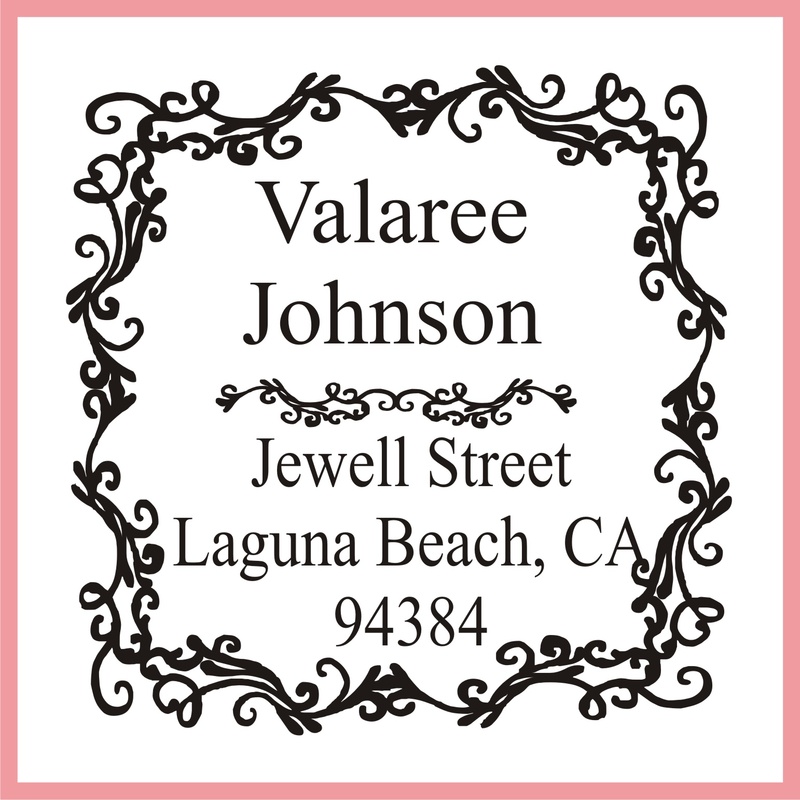 I would choose the valaree stamp for my sister who just moved. I would choose the "latham library stamp"
I love the circle name pad with matching ribbon! great giveaway! i'd love to have the return address patterson stamp. i follow on twitter as scoop500. now following mommypads on twitter as scoop500.